St. Marys, Georgia, the Gateway to Cumberland Island National Seashore, is a small coastal village located in southeast Georgia. One of Georgia’s best kept secrets, St. Marys is rich in history, natural beauty and Southern hospitality, and along with Cumberland Island National Seashore, offers the perfect escape from the hustle and bustle of everyday life. As you stroll along the waterfront, you will be captivated by the friendly people, the mild climate and the charm that are unique to St. Marys. Come visit us soon! 9 miles east of I-95 between Brunswick, Georgia and Jacksonville FL, you will find a variety of accommodations, including 3 charming bed & breakfast inns: Belle Tara Inn, Spenser House Inn, and Goodbread House; Riverview Hotel, a historic hotel on the waterfront, and family style modern motels and mini suites with kitchenettes, including Cumberland Island Inn & Suites and Cumberland Kings Bay Lodges. St. Marys offers a very wide variety of dining establishments, with menus for everyone’s taste, from traditional Southern cooking buffet style to legendary coastal seafood, steaks and chops. You’ll find a deli, coffee house, Greek and Mediterranean Grill, Japanese Steak House, Mexican, and delicious burgers, bring your appetite! Charming St. Marys affords visitors a gracious welcome along tree-lined streets where white picket fences surround many of the historic landmarks. Gift and antique shops housed in turn-of-the-century buildings offer hours of browsing. Take the 45 minute ferry to Cumberland Island National Seashore, visit the Welcome Center and House Museum at Orange Hall, visit Oak Grove Cemetery, dating from 1801 and including graves of veterans from every war. The Submarine Museum near the Waterfront is one attraction not to be missed! Enjoy fantastic Golf and views at Osprey Cove Golf Course and Laurel Island Links, explore nearby Crooked River State Park, or the Okefenokee Wildlife Refuge, just 45 minutes away. St. Marys is accessible from I-95 Exit 2, on State Road 40. Most of the lodging and many dining facilities are within walking distance of the Historic District. 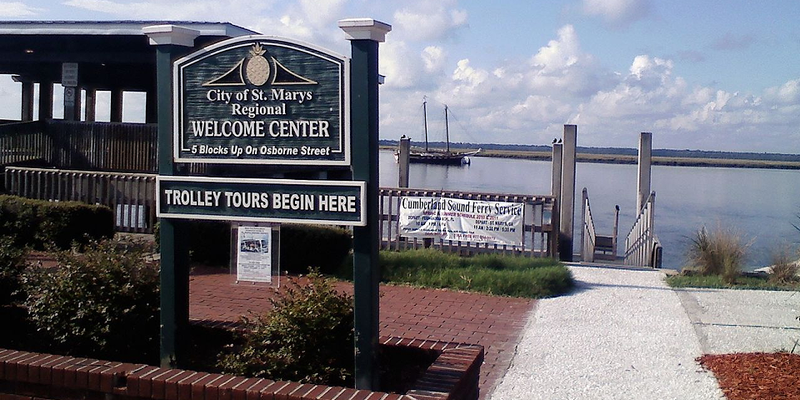 By boat, St. Marys is on the St. Marys River, just west of the Intracoastal Waterway, offering docking and marina facilities for transients. Need more? Try these links for additional information about St. Marys, Georgia. Welcome to Historic St. Marys, Georgia, Gateway to Cumberland Island National Seashore. Visit our site for all the info you need to enjoy our charming city.